Ok, before I go any further, these were semi DIY. I went through and picked the flower combination, designed the ribbons around the vases and decided to do groupings of 3, the bulk of the work was actually done with the assistance of my wedding planner. She isnt a florist (and the last thing I wanted to do was spend money on expensive florists) but we decided that centerpieces can be done by ourselves and still look really pretty. My planner has a collection of square vases in various heights so I really wanted to incorporate them into the centerpieces. This set of 3 will be one type of centerpiece which will be alternated with a calla lily centerpiece. The navy ribbon matches our color theme/bridesmaid dresses perfectly. 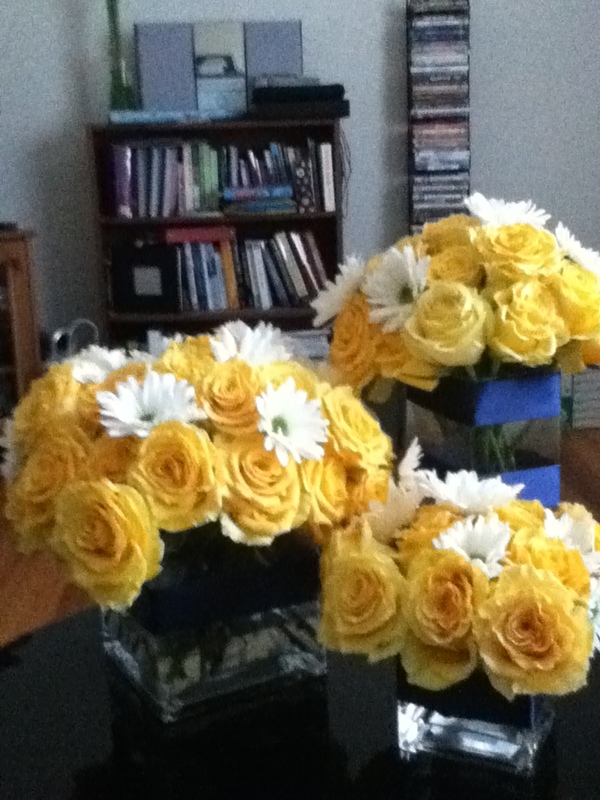 Since our colors are navy and white, I used yellow roses as an accent color with a few white daisies scattered. To arrange the flowers, tape was used on the top of the vases to form a grid and hold the flowers in place and upright. Now that the weather is finally starting to warm up, I am starting to see trees and others plants blooming with flowers. I love that Atlanta is a city with trees and parks, not just skyscrapers. I am so excited for the colors of spring. While driving and thinking about colors, I started to think about our wedding. The wedding colors are navy blue and white (and no it is not a penn state themed wedding, although it crossed our minds). 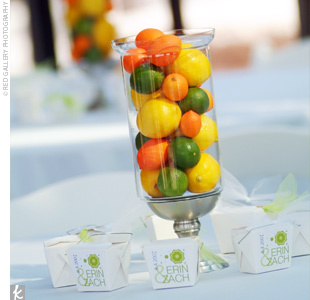 I love this color combination but since the wedding is in the summer I wanted to add a bright accent color. We decided to add yellow as an accent. 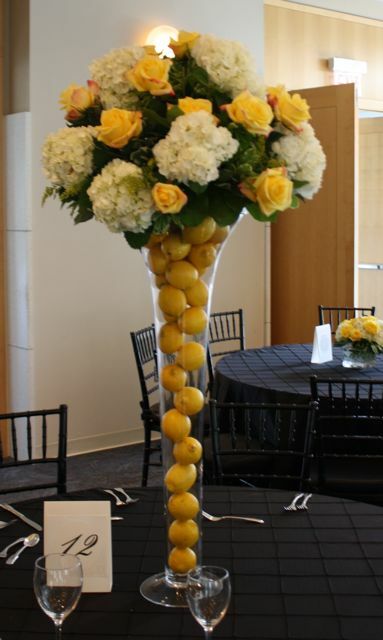 This is a mixed citrus vases. I would probably do mine with lemons and maybe a navy ribbon? Now I do not want to rule out flowers completely so this could be an option?? I am still trying to figure out the final details but I think these can be great options, especially for our summer wedding! As I write, I am watching the news and looking outside as a tornado warning is over Atlanta. Yes, thunderstorms and tornadoes in February. I guess that shouldn’t be too surprising after our spring-like weather for the past few days in the 70s. 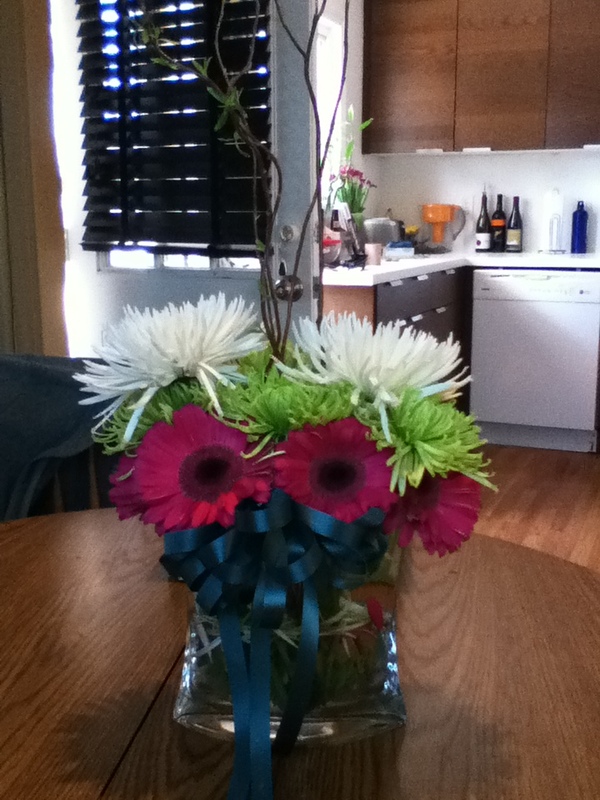 Oh well, off to brighter things….flowers! Since there is no real arranging involved, this is something that I can do on my own (well, with the help of my family) and can avoid florist costs! 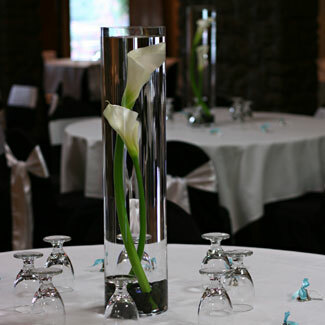 You can buy a large calla lily for $5 and the vase price can vary depending on size. I am using a 20inch diameter cylinder vase and will add clear gems on the bottom with a submerged LED for lighting. All in all, each centerpiece is under $40 (compared to spending $100+ per table having floral arrangements made). Monday: Ok, I know I just took a break on Fri but the weather is really bad out so I will use that as my reason for taking another break today. On a positive note, we have identified a P90X start date-March 13. This will give us time to buy healthier food and mentally prepare for the next 90 days. I am anticipating some very exhausted (but hopefully positive) blogs in that time!